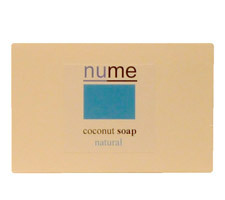 Our range of coconut soaps are made with the highest quality ingredients and because the soap you use plays such and important role in the health and appearance of your skin, we have created a range of mild gently effective cleansers. The cold pressed virgin coconut oil has healing properties and the natural Glycerine helps maintain the moisture balance of the skin. Coconut soaps have a light, fluffy lather that leaves your skin feeling soft and fresh while looking balanced and healthy. Designed for all skin types, the natural fragrance free is especially good for babies skin, fragile and acneic skins. Use with warm wet hands or in the shower. Lather up and apply to the face avoiding the eye area..
You may use with a Riffi Mitt for more thorough cleansing and a gentle exfoliation. Splash rinse off with warm water.